SAA is proud to announce that a new A330-300 will be operating on the London-Johannesburg route from 25th March 2018. The aircraft offers state-of-the-art technology; they are quieter than previous generation aircraft, equipped with advanced avionics and navigation systems, and are more environmentally friendly due to ultra-fuel-efficient Rolls-Royce Trent engines, resulting in lower fuel burn and, as a result, lower carbon emissions. 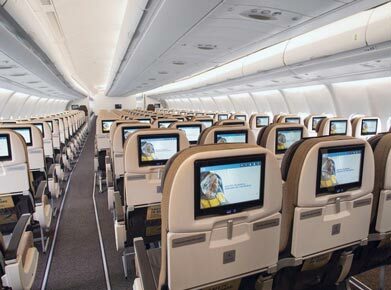 The A330-300s offer more Business Class seats than any aircraft already in the SAA fleet. In total, the aircraft has capacity for 249 passengers, with 46 in Business Class and 203 in Economy Class. With effect from 20th April 2018, SAA will operate a single daily flight from London Heathrow to Johannesburg from the double daily service operating on the route currently, whilst continuing to offer customers easy onward connections to over 30 destinations across Southern Africa. South African Airways bring the world to Africa and take Africa to the world. South African Airways is dignified to be the national airline of South Africa and is dedicated to provide the highest standards of excellence in serving their customers. The airline caters to various major destinations within South Africa from its Johannesburg hub. Economy Class on the A330-300 is fitted with newly designed seats with personal space and generous legroom for travelling comfort. Each seat is fitted with a 10.1” high-resolution screen, individual USB charging ports, and access to shared PC power points, so customers can enjoy the latest movies and TV shows, on-demand. Seating in the Economy cabin remains in the popular 2-4-2 configuration, continuing to ensure that customers are only ever one seat away from the aisle. 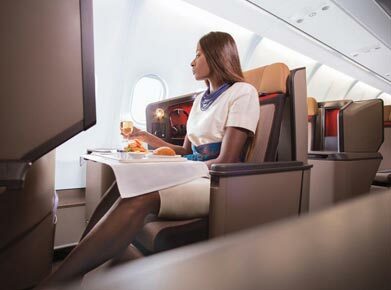 Business Class on the new A330s is set to make customers between London and Johannesburg feel at home in their very own ‘living space’. Seating in Business Class cabins is in a staggered 1-2-1 configuration, offering all customers a forward facing, lie-flat seat, increased privacy and direct access to the aisle. To give customers the best possible viewing experience, each seat is fitted with its own high-resolution, 15” screen. There is space for personal tablets to rest in the back of the seat and SAA has introduced an app where customers can download additional entertainment before their flight. Customers will experience restaurant quality a-la-carte dining, served with award-winning South African wines. 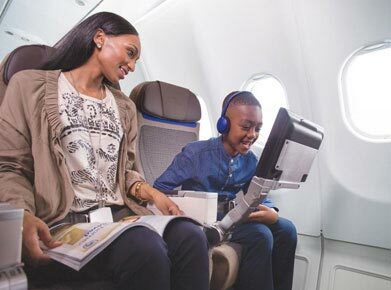 Sky is the limit for those travellers taking to the skies with South African Airways as they are offered the exclusive entertainment when surrounded by the clouds. Your journey would become an unforgettable one with so much to do on board. You can be delighted with the latest blockbusters to news, music and interactive games. The airline’s in-flight entertainment has something for everyone. Flying with South African Airways proves beneficial as the passengers are offered with an entertainment system with one of its kind features. You would be amused for more than three hours watching the best movies, TV shows, music and interactive games. Settle down with a wide range of movies and audio programmes. Aircrafts like Airbus A340-600, A340-300 and Boeing B747-400s are fitted with audio and video on-demand systems such as Sony P@assport or Panasonic 3000 system. Personal television viewing (PTV) offers a never-ending stream of highly praised TV shows, documentaries and the latest movies. Passengers flying in Business Class on Airbus A340-200 are eligible for PTV.